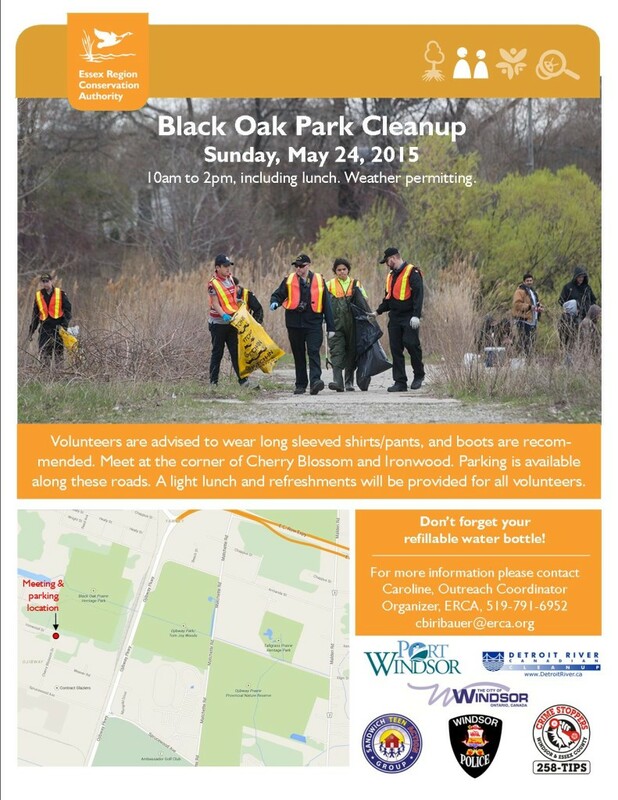 Volunteers Needed – Black Oak Heritage Park Cleanup! The Detroit River Canadian Cleanup, the Essex Region Conservation Authority, the City of Windsor, and the Windsor Port Authority are hosting a cleanup event at Black Oak Heritage Park and are looking for volunteers to help! Spring 2015 Little River Cleanup! For the past few years, Caesars Windsor Code Green volunteer group has contacted Caroline/ Essex Region Conservation Authority and requested a site for them to clean up. She coordinates and organizes the event to help them celebrate Earth Day. Hawthorne site: the section of Little River between Tecumseh Road East and Lauzon Road, adjacent to the Canadian Tire Store on Tecumseh Road. The Hawthorne site has been cleaned up 13 times between 1996 and 2014; it is notorious for shopping carts and enormous amounts of litter. Shopping carts are used by the locals to build a bridge across the river as a shortcut from the Forest Glade subdivision to the stores on Tecumseh Road. Basically, the supply of carts comes from the shoppers at the stores who take the carts home, but do not return them. The other issue: litter is blown in by the winter winds and collects along the tree line in the riparian zone of Little River. We observed it is mostly recyclable material, so concluded it blows out of the neighbourhood recycle boxes. Old Channel site: the section of Little River in east Windsor which follows the original meandering channel, before the course of the river was straightened and the banks bermed. The Old Channel has been cleaned up 11 times between 1989 and 2002; this is the site where Concord Public Elementary School and the Little River Enhancement Group began the project of improving the watershed ecosystem. Twin Oaks site: the Twin Oaks Business Park is south of E. C. Row Expressway and east of Lauzon Parkway. This site has been cleaned up 4 times between 1994 and 1996; it was formerly the Twin Oaks Golf Course. It is also a demonstration site for the rehabilitation of a river course from a U-shaped, erosion prone channel to a gently sloping, flood water retention area and natural habitat for wildlife. Our observations revealed: the Hawthorne site could use a cleanup of several shopping carts and countless bags of litter, the Old Channel had very little litter, and the Twin Oaks site has a road, Munich Court that had an enormous amount of garbage at the end of it. We were shocked at the debris dumped at the end of a road into the business park. After 36 watershed cleanups, you would think we are accustomed to the sight of piles of discarded rubbish, but this annoyed us. Apparently, people feel they have the right to dump their garbage anywhere for others to clean up. Clearly, easy access to this isolated site is the cause of dumping all kinds of garbage: mattresses, concrete blocks, sofas, chairs, clothes, plastic pails, construction materials and other stuff people feel comfortable dumping there. Update: we are pleased to report, with the help of City of Windsor Councillor Hilary Payne, this site has been cleaned up with a front end loader and truck! However, it didn’t take long for someone to dump another load a few days later. Steadfastly, Councillor Payne asked the City to block the road with barriers, so it will stay clean. We will plan for a future, general cleanup of the debris that remains throughout the site that the heavy equipment cannot reach. The Code Green group chose to clean up the Hawthorne site again. On Wednesday, April 22, (Earth Day), 30 volunteers participated in Little River Cleanup Event # 37. Mother Nature presented us with a challenge: 4 C temps, mainly cloudy, wet flurries and gusty winds from 30 to 50 km/ h! As usual, only resilient volunteers attended and cleaned up from 4:00 p.m. to 7:00 p.m. This was the 14th time the community has cleaned up the debris from this site since autumn1996. 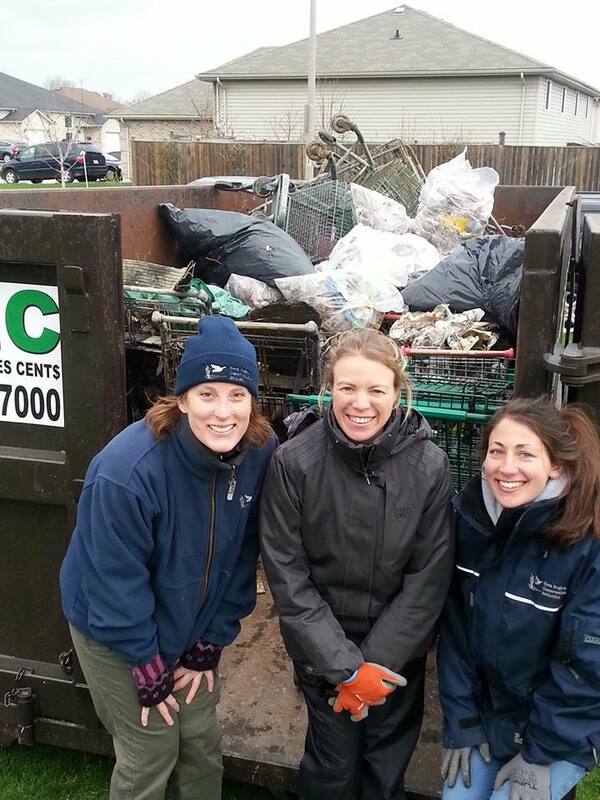 Along with the Code Green group, there were volunteers from the City of Windsor, the Detroit River Canadian Cleanup, Essex County Nature and the Little River Enhancement Group. This robust working group pulled out 16 shopping carts. Some of the unusual items removed from the river: a wooden rocking chair and an automobile hub cap. As well, countless bags of litter items were removed and the riparian zone of Little River looks a lot better from the volunteers’ efforts. RMC – Recycling Makes Cents, provided a recycle bin at the site and they will sort through the recyclables: cardboard, aluminum cans, glass bottles and newspaper. We appreciate RMC for providing this important service, otherwise, all the recyclables would end up in the landfill. The water in the Little River was flowing at a steady pace and it was clear. Over the years sediment has been deposited on both sides of the river course. Seeds from local trees and shrubs have rooted and grown to maturity. This has forced the river to follow a meandering pattern. Once again Mother Nature has taken an engineered river bed and returned it to a more natural area. Lil’ Reg and ERCA appreciate Code Green for mobilizing their volunteers and helping to coordinating this cleanup event and look forward to working with them in the future.